One more tool of SAPIEN’s 2009 software lineup will be available for beta testing this week. 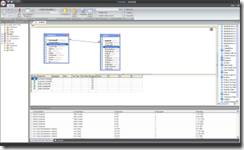 PrimalSQL 2009 makes database query development and testing a snap. Regardless of your database type or vendor, PrimalSQL 2009 will connect to them all and allows you to visually build your queries. Its modern, streamlined interface makes PrimalSQL easy to understand and use. From simple select statements to complicated outer joins, from just checking if a connection works to editing stored procedures and live data, PrimalSQL 2009 provides all the tools you need every day to create efficient SQL statements quickly and effortlessly. – Database vendor independent connections create independence and flexibility. – Connect to any number of databases mixing vendors and connection types. – Create complex queries without expert SQL knowledge. – Visually create your queries or edit them as SQL code with PrimalSense support. – Switch connections on the fly to run a query against multiple data sources. – Edit and create views and stored procedures in an easy to learn environment. – Live query and data edit support supports ad-hoc queries and testing. – Export query results to CSV, HTML or XML for further processing. – Browse and search your database structures from a versatile user interface. PrimalSQL 2009 is scheduled to be released by February 1st 2009.